Alice Cherestes, interim Director of the Freshman Program in the Faculty of Agricultural and Environmental Sciences; and Teresa Zatylny, Administrative Student Affairs Coordinator in the Faculty of Engineering, were recently presented with the Dean of Students Award for Excellence in Undergraduate Academic Advising. 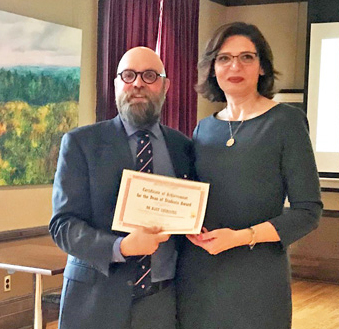 In its third year, the award aims to celebrate the integral and valuable contribution that academic advising makes to undergraduate student life at McGill. Advisors provide timely and individualized guidance to help students make informed academic decisions in light of their learning, career, and life goals.